Enjoy just the right amount of narration and quiet time to take in the scenery and history as you travel on the Apache Trail. You'll be taken through the beautiful Sonoran Desert scenery east of Phoenix on the way to Canyon Lake. A few possible spots to stop and visit along the way are the historic Goldfield Ghost Town or the Canyon Lake Vista. 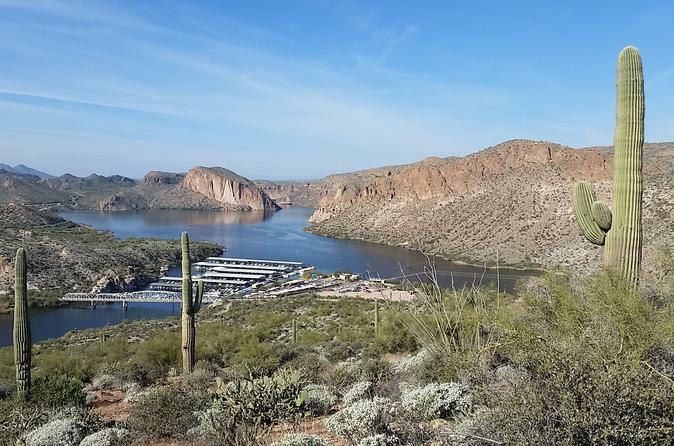 Your expert guide will take you on the famous Apache Trail for about a 6 hour visit, making sure you get all of the best that the area has to offer. The Apache Trail is one of the Phoenix area's top destinations and a must-see. Lake Cruise admissions, bottled water and soft drinks are included. Meals are not included. Dining options can be discussed at confirmation.